Last week I held a social media session for Habitat For Humanity Central Texas. What an amazing group of people. I promised I would share all of the social media tools I have collected. One of the participants recommended I blog them because as she put it; there are a lot of people who could really use them. 1. Social Media 101: A great presentation introducing social media. 2. From my favorite Social Media Guru, the Marketing Savant a ton of valuable resources can be found here. Take-away: Get online and start connecting, your donors are in the social sphere and you should probably be there too! Building a strong brand is probably one of the least invested in, most valuable activities a nonprofit can undertake. Branding plays an important role in your nonprofit. Your brand is your personality. The presentation above was designed to be a how to guide for nonprofits that are seeking a stronger brand. Consider strategic issues the brand faces, growth potential, barriers and challenges. What can your team do to get ahead of these issues, capitalize on them, and grow as a result of them? Take a look at what you do, who you are, and who you want to be. What are your brand features, benefits, personality, and essence? After you define who you are and make a plan for what you want your brand to be, you must share it. Create a plan on a page. Share it with volunteers, staff, and board members. It is important to be able to clearly articulate who you are and more important for others to be able to articulate who you are. Define what you are going to do, who is responsible for doing it, and who the project owner is. Write it down and hold meetings to keep everyone accountable. A strong brand is only as strong as those executing it. Are your brand efforts working? It’s ok if they aren’t, but it is not ok if you don’t know. Measure your likelihood to recommend every six months to make sure you are making headway. Other metrics to look at include web hits, social mentions, and referrals if applicable. Take away: With the new year it is a great time for nonprofits and governments alike to try something new. Why not try something like this? 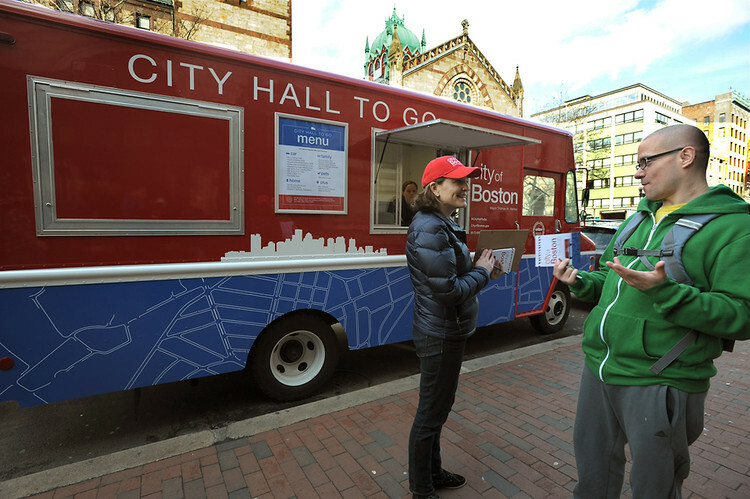 Whether in a food truck, booths at local events, or in places that are commonly visited attempting to bring your mission to where the people are can’t be a bad idea. Way to go Boston! Should I be investing time in Facebook for my nonprofit? Today Facebook is a controlled way for people to connect with existing friends. Most users simply use Facebook to engage with people they already know. Facebook is a relationship tool, it is not an advertising platform (today anyway). So if you are in the nonprofit space it is a great tool for you to use to spend time building connections and relationships. So should you be investing time and effort in Facebook? To truly determine how much time, if any, to invest in Facebook, you will need to know your donors/constituents. Do they use Facebook? How often? Do they use another social network more often? Has your nonprofit seen any benefits from being on Facebook? Look at your marketing strategy to see if your time and resources could be spent more effectively somewhere else. To determine what your organization should do, you will need to determine what your goals are. Do you want to build Facebook as a primary engagement tool or do you just want people to be able to find you if they look? If you decide to invest in Facebook also invest in a measurement tool. I recommend Sprout Social because it is easy to use and affordable. Using your measurement tool, determine what information your donors love to see, read, and share! For us, people love to hear about anniversaries. The tool is truly about relationships, and that shows in our results. Make it worth the visit; reward people for visiting your Facebook page. This will make them want to visit more often. Make certain resources only available on Facebook to encourage users to keep an eye on you. For nonprofits, think about a special event for Facebook friends only. Pictures, videos and articles are highly popular on Facebook. If possible, make sure every update includes an image or video. Be sure and upload pictures during events and following events. At your event make sure you announce that the photos taken will be on your Facebook page following the event. Check out the Color Me Rad page for a great example. Do not post every day. As a small nonprofit, you may only need to post once or twice a week. Quality or quantity is the rule for sure. Post when people are on Facebook. According to the Huffington Post, the best times to post are weekends by far, followed by evenings and early mornings. Use the Promote button for your most important posts to push them to the top of the news feed. This does cost money, with the exact rate depending on your geographic location and how many users you wish to reach, but it can be worth it for advertising posts. Take-away: For those nonprofits in the business of building relationships, Facebook is a great way to truly build engagement. What do I do? My donors are 80+ and not adopting new marketing. In my session hosted by the Hill Country Community Foundation, I had this question. How do I reach donors that are 80+ and not adopting social media, email, or any other new technology? Well, I think the person asking had hoped I would reveal the answer to how to get this demographic to participate online, but I don’t have the answer to that question. 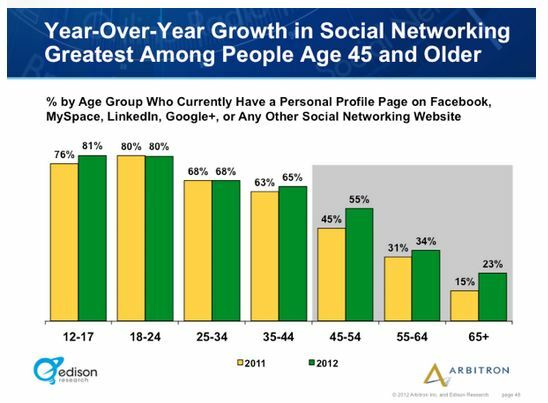 Though trends show that individuals in the 65+ demographic are adopting social networking I don’t think they will ever be key adopters. As such, it is important to start to develop a marketing plan that satisfies the needs of your current donors while building a presence that will allow you to target new donors. 1. Think about children’s programs. Can you do camps, tours, classes, etc…programs like this allow you to foster new relationships while continuing to offer existing ones. 2. Use multichannel marketing mixes in your campaign development. For example: don’t just mail an event postcard. Mail a postcard with a Facebook link to the event. This way your non-Facebook donors have the information along with your Facebook fans. 3. Meet your donors where they are, but don’t forget about the future. It is important to be in the social space while maintaining your existing donor base. Consider using college students to help your organization gain social presences without distracting efforts to maintain your current presence.